Brawn is one of my all time favourite Transformers Minibots. I did have the original G1 Brawn as a present when I was a kid. I think I still have G1 Brawn in storage, I still have to dig him out. My Grandma (Lola) gave Brawn to me as a birthday present. Brawn was my first Transformer. Most of the Transformer Minibots were affordable when I was a kid. About $5 or under. I like Brawn just because he was tiny he was tuff and feared by some of the Decepticons. When I was a kid I was considered tiny. I want to be tuff like Brawn. I love this Titans Return Brawn. Very close to the G1 cartoon, I been waiting for a long time for a G1 version to come out and I gotta say he turn out way better than what I expected. Come back and check out my other Transformers Generation Figures. Optimus said "One shall stand, one shall fall". I do both. 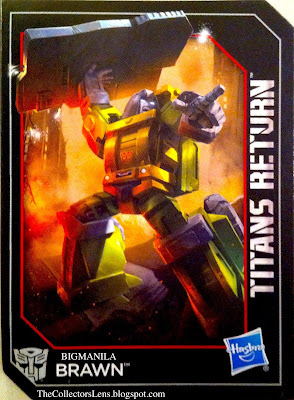 One thing I was disappointed in this Titians Return Brawn figure was that he does not come with a gun or any weapon. I guess the spare tire acts like a shield or could possible be a gun too. Fortunatly they do have a TRANSFORMERS Generations Titan Masters Brawn that can be used as a head master and also a weapon. Its cool too but it would be nice it he came with a better weapon. Brawn is one of the strongest Autobots in the Transformers television and comic book series, both based on the popular toy line produced by Takara and Hasbro. His vehicle mode is a Land Rover Series III 4x4. Brawn has not had a mass market toy release for several years and, until recently, the character has not been featured in the modern Transformers Universe. Brawn's character biography describes him as one of the original eighteen Autobots - very strong despite his small size. He is further described as brave with physical strength that almost matches Optimus Prime, able to lift weights of up to 190,000 lbs. and strong enough to level a small building with a single punch. His physical resilience is also high enough to resist artillery fire, but he has an innate weakness to attacks based on electromagnetic waves. Brawn loves rugged and hostile environments and is always up to test his mettle against a new challenge. In The Transformers: The Movie, set on Earth in the year 2005, Brawn was assigned to Moonbase One along with several first season Autobots. He was later assigned to make a special supply run to Autobot City on Earth. During the shuttle mission, Decepticon forces invaded the shuttle. 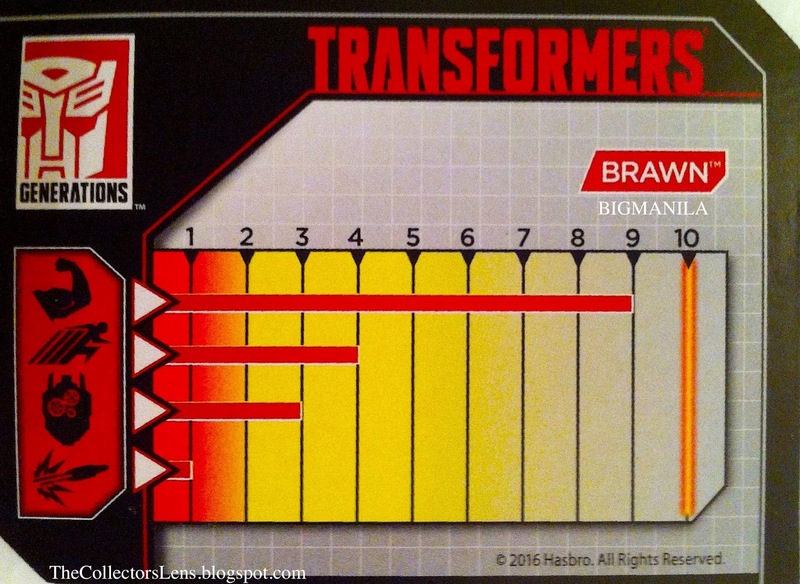 Using Megatron in pistol mode, Starscream killed Brawn with a single shot to the shoulder. Brawn's death is disputed among fans. Although one of the strongest and toughest Autobots, in the movie he is rapidly dispensed by a single piercing shot to the shoulder. His absence from the list of deceased Autobots in "Dark Awakening" (replaced in a list of those killed in the shuttle attack with Huffer), plus an appearance in the post-movie episode "Carnage in C-Minor" has inspired ongoing debate as to whether the character is truly dead. The episode shows Brawn, a miscolored Huffer, and Bonecrusher fighting together against a weapon built by Galvatron. This appearance is generally considered an error, as the episode is riddled with animation mistakes. Although select fans continue to argue Brawn's survival, in addition to the animation, confirmation of his demise can be confirmed in the Movie script and comic book adaptations; all depict Brawn being killed.